Demonstrators gathered at the State Capitol in Denver to protest the use of pesticides and its effect on the bee population. Images include protesters in bee costumes. Man wearing bee costume, playing drum made from bucket, dancing down stairway, other protesters with signs and banners marching behind him. 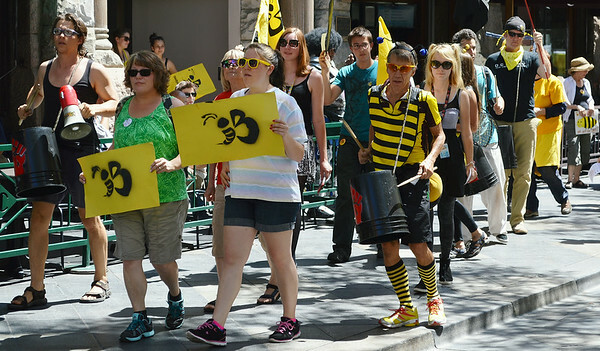 Group on marchers carrying signs with bees on them, one protesters in bee costume palying drum made from bucket. Man wearing bee costume, playing drum made from bucket. Young woman in bee costume holding sign about saving the bees, large flag behind her. Man wearing bee costume holding sign "Give Bees a Chance". People in bee costumes pretending to die from being sprayed with pesticides by person in hazardous materials suit, face mask. 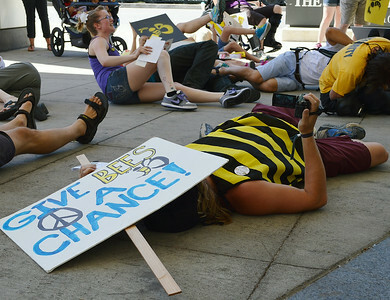 Protester in bee costume pretending to be dead, holding video camera, "Give Bees A Chance" lying on their head, other in background lying down. People in bee costumes pretending to die from being sprayed with pesticides. 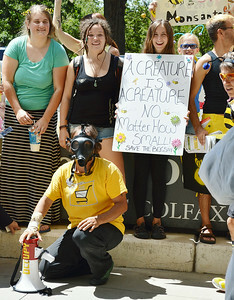 Man wearing gas mask, holding bullhorn, woman behind him holds sign about bees and pesticides. Two young girls wearing bee antenna.